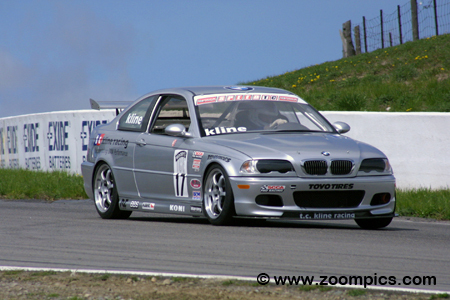 The second round of the 2002 Speed World Challenge Touring Car season was held at Mosport International Raceway in May on the Victoria Day long weekend. Drivers would compete for fifty-minutes around the ten-turn 2.459-mile road course. 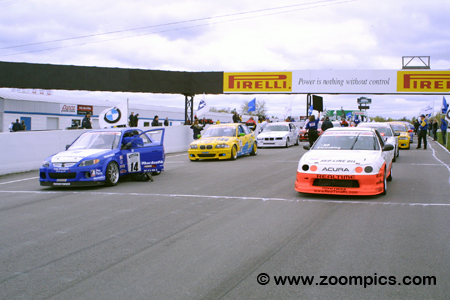 Forty-seven competitors are gridded on Mosport’s front straight for the start of the 2002 Speed World Challenge Touring Car race. On the pole is last year’s STAR Mazda champion and series rookie, Scott Bradley in the No. 14 Mazda Protege. 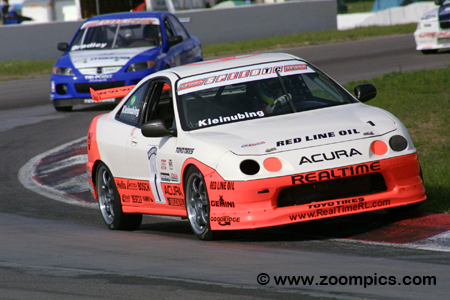 Sharing the front row with Bradley is the defending race winner and series titleholder in an Acura Integra Type R prepared by RealTime Racing, Pierre Kleinubing. Ken Dobson driving the SSF Imported Auto Parts BMW 325Ci gave defending class champion, Pierre Kleinubing all he could handle at Sebring but came up short and finished second. Dobson was second quickest during the practice sessions at Mosport International Raceway and qualified fourth. After a terrific start, he moved into second. Dobson grabbed first place from Will Turner on lap-nineteen and scored his first series victory. Speed World Challenge Touring Car veteran, Will Turner topped the timesheets in practice. During qualifying the driver of the No. 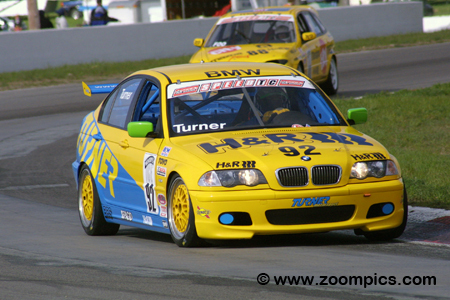 92 Turner Motorsports prepared BMW 325i fell to the third spot. Turner jumped from his starting position and moved into first place on lap-1. He led the field for the next eighteen circuits but slid wide at turn two which allowed Ken Dobson to slip past. Unable to regain the position, Turner finished second. Defending Speed World Challenge Touring Car champion, Pierre Kleinubing won the opening round at Sebring driving his familiar RealTime Racing Acura Integra Type R. Kleinubing lined up on the outside of the front row but completed the first lap in fourth place. For the remainder of the contest, he chased the faster BMWs of Will Turner and Ken Dobson. On lap-3, Kleinubing passed Scott Bradley for third and held the position to the finish. 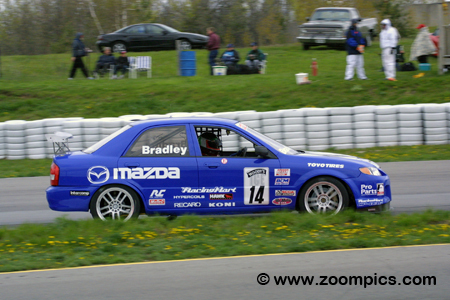 Scott Bradley, captured his first Speed World Challenge Touring Car pole position, outshining a field of forty-eight competitors in his Mazda Protege at Mosport International Raceway. Unfortunately, last year’s STAR Mazda champion could not hold off Will Turner, Ken Dobson, Frank Selldorff and Pierre Kleinubing and was fifth on the first lap. When Selldorff encountered issues, Bradley inherited a fourth-place finish. 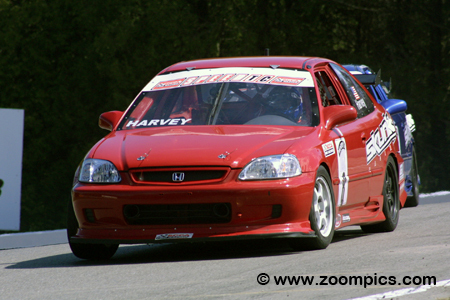 Another series veteran participating in this weekend’s event was Taz Harvey in the NN Racing Honda Civic Si. Despite contact in the season’s first contest at Sebring, Harvey finished eighth. 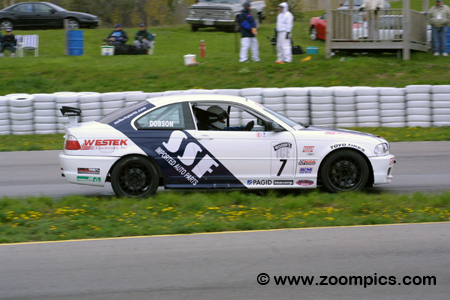 At Mosport International Raceway, he was gridded twenty-second for the start of the twenty-five-lap race. By lap-16, Harvey was in fifth place and remained in that position until the checkered flag. During the event, he recorded the third fastest lap. It may read, T.C. Kline on the windshield but Boris Said drove the No. 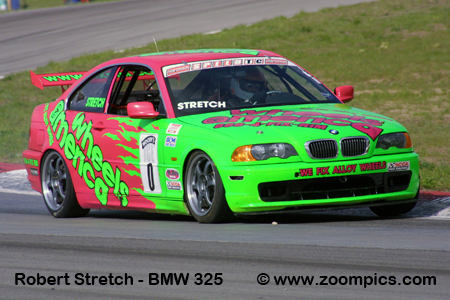 17 TC Kline Racing prepared BMW 328Ci. Said was pulling double duty this weekend also participating in the BF Goodrich Tires Trans-Am series. He started the World Challenge contest in forty-eighth place and finished twenty-first – earning B&M Hole Shot award. Said had a lot more success in the Trans-Am race – he won driving a Panoz Esperante. 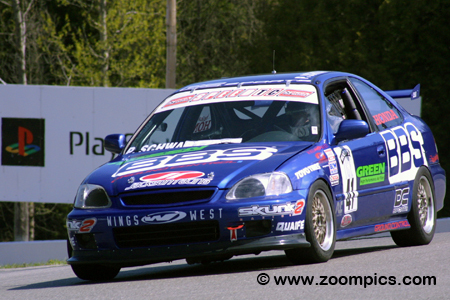 Three-time SCCA Pro Racing World Challenge race winner and forty-year road racing veteran Peter Schwartzott returned to the series at Mosport in a Honda Civic Si. A retired fine arts college professor, Schwartzott began SCCA racing in the early 1960s. He has won many championships, most recently the 1997-1998 Speedvision Cup and the 1999 Motorola Cup. In his return, Schwartzott qualified forty-fifth and finished twentieth. 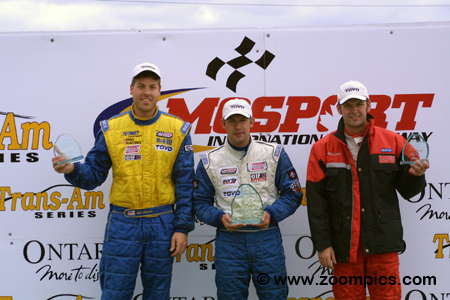 The Speed World Challenge Touring Car podium at Mosport International Raceway. On the left side of the rostrum is the runner-up and team owner of Turner Motorsports, Will Turner. Standing on the opposite side of the podium is the defending series champion and points leader, Pierre Kleinubing. In the center and grabbing his first SCCA Pro Racing victory is Ken Dobson.